If you're scratching your head wondering what Top Trumps is all about, and perhaps think it's an online slot solely featuring images of Donald Trump, think again. Top Trumps is a classic card game that's been around donkey's years but seems to go through renaissances now and then. Coming in all themes - dinosaurs, football, cars, horror films - Top Trumps works like this: you split the cards between two players and read a category from the card (Dinosaur's height, a footballer's career goals, etc); whoever has the highest number wins the card. The process continues until one player has all the cards and wins. Playtech have released several Top Trumps-themed slots online of varying degrees of quality with Top Trumps Football Legends being my personal favorite, but Top Trumps Celebs seems to hit all the right nails on all the right celeb heads. Played out over 5 reels and 20 paylines, most of the icons on show - other than the standard 10-to-Ace poker symbols - are made up of photos of Hollywood celebs. So, making up the icons are, er, icons of modern celebrity: Sean Connery, Colin Farrell, Johnny Depp, 50 Cent, Nicolas Cage, and Owen Wilson. So, what if Johnny Depp isn't your cup of tea, and Nicolas Cage has no right to be anywhere near the reels? Well, there's a special feature in the game where you get to select which icons will spin on the reels. You can even change the Wild too! This way a whole new list of celebs appears, including Matt Damon, Cristina Aguilera, Beyonce, David Beckham, Liz Hurley and Sienna Miller. Johnny Depp is Wild... Initially! The Deppster is Wild (unless you change him, of course, with Elvis, Madonna and Brad Pitt the choices) and substitutes for all regular icons in the game other than the Scatters. Everyone's favorite quirky leading man also pays the jackpot at 10,000 coins for hitting five. 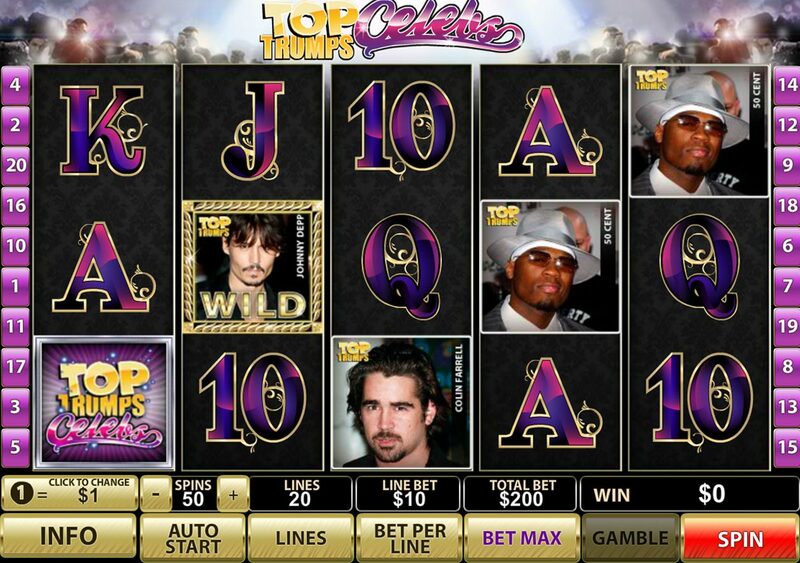 Three or more Top Trumps Celebs logos on the reels anywhere triggers a free spins bonus round with 10 spins up for grabs. 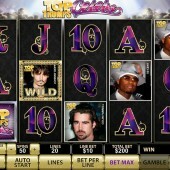 A bonus Wild (of one celeb of your choice) is added to the reels too and multiplies wins by 4. Hit the Bonus red carpet icon on reels 1 and 5, meanwhile, and you will trigger the Red Carpet Bonus feature. Essentially, the feature is a straight Pick'em Bonus round. You will see a 4x4 grid filled with familiar celebs - simply pick three of them to reveal prizes. Basically, these are just multipliers on your win, but you can bag yourself multipliers up to 10x if you choose well. For celeb fiends everywhere, Top Trumps is a great game - there's loads of Hollywood glamor, and the bonus rounds can be pretty lucrative too. As I mentioned above, I personally love the football version from slot developer Playtech more but this is sound enough as a stand alone slot and fans of the Top Trumps series will definitely get a kick out of this slot.